This Tuesday, top executives from leading technology and services companies around the world gathered at the Petersen Auto Museum for one of the premier industry events focused on digital disruption. The Empowering Beyond Summit featured innovative discussions around the theme, “Accelerating towards a Digital Future”. The morning session started with an opening keynote by Avasant CEO, Kevin Parikh. He focused on how digitally-driven, industry-specific solutions are revolutionizing the manner in which the provider community can create value for their clients. CIO of Jet Propulsion Laboratories (JPL), James J. Rinaldi, dazzled the crowd with video footage of successful missions JPL has spearheaded while discussing how technology has shaped space exploration and helped them “Break new Frontiers”. The closing Keynote Joe Weinman, Digital Strategist and bestselling author of Digital Disciplines, approached the Digital Disruption theme holistically—analyzing the business, cultural and societal implications of digital technologies. Senior executives from two of Avasant’s Transportation sector clients, BNSF Railway and Greater Toronto Airport Authority (GTAA), spoke on how they are bringing about fundamental transformation to their enterprises by leveraging digital business models. Kevin Parikh also moderated a CEO panel featuring businesses that have disrupted their respective industries through digital innovation. The panel featured Dirk Ahlborn, CEO, Hyperloop; Jeremy Barnett, CEO, Trendy Butler and Frank Monestere, President & COO, Legal Zoom. In the afternoon, the guests had a unique opportunity to engage in industry-specific conversations regarding Cyber Security, Digital Transformation and Managed Governance services. This landmark event attracted over 170 leading decision makers from companies such as IBM, Cisco, HP, Dell, Cap Gemini, Infosys, TCS, HCL, Wipro, Cognizant, Tech Mahindra, Atos and others. Avasant’s engagement in the global market has inspired a strong commitment to community and purpose. 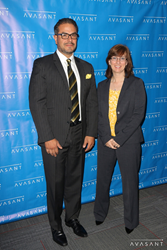 Avasant Foundation supports technology and skill development programs to create employment opportunities for youth. In this regard, we have implemented three critical programs across Africa, Asia, the Caribbean and Latin America. Within the US, our efforts are focused on supporting Science, Technology, Engineering, Arts, and Math (STEAM). For more information, visit http://www.avasant.com. Follow news, photos and video on Twitter at http://www.twitter.com/avasant, Facebook at https://www.facebook.com/avasantllc, and LinkedIn at https://www.linkedin.com/company/avasant. For complete event details, please visit http://avasant.com/events.